This is my first post, not counting my introduction. I apologize for these being newbie questions. I picked up a scuttle at a thrift store for next to nothing. In fact, when I found it, I recognized it as a shaving thingie but had no clear idea of its use. Since then I've googled and done some research, but my understanding is still a bit foggy. The Merkur is included in the picture for size reference. The scuttle has cracked glazing (could be regarded as patina, I suppose) but seems perfectly usable. There seem to be more than one way of using these, the most common (?) to simply place the loaded-up brush in the top cup and hot water in the bottom compartment. Some people seem to actually use the top cup as a lathering bowl? What is the proper way to use a scuttle? Also, the most newbie question of all: what exactly is the point? I understand it heats up the lather and brush but is this simply to make the shave comfortable or is there a "technical" reason, does it improve the thickness of the lather, soften the beard or something? I have also seen some people sticking the brush into the "pipe" to soak it/heat it up, but due to the design of this scuttle that would require a bigger brush than the one I have as it disappears into the scuttle. Thanks in advance for any answers and/or comments on this find. hot lather feels better. make your lather in the top bowl, there are plenty lather making videos in TSN and youtube and probably a few on using a scuttle. as you do multiple passes your lather stays warm throughout the shave heated from the water in the lower cup. you have gotten a great deal on a beautiful scuttle! Does the bowl part have holes in the bottom? If so, then it's just a brush warmer, right? (02-25-2019, 09:49 AM)RyznRio Wrote: hot lather feels better. make your lather in the top bowl, there are plenty lather making videos in TSN and youtube and probably a few on using a scuttle. Thanks for the reply. I suspected as much but I wanted to make sure I wasn't missing something. (02-25-2019, 09:51 AM)Tonality Wrote: Does the bowl part have holes in the bottom? If so, then it's just a brush warmer, right? It does indeed. Makes sense, thanks. Pretty small holes, you could probably still make a nice warm lather in there. Yes, they are. I'll experiment when I try it out and see how it goes. jmho, this type of scuttle was used before people had running hot water in the house. The scuttle was filled with hot water from the stove. The shaving brushes were smaller then and likely to be boar. Boar brushes are more hardy and can stand more heat while also retaining the heat. Most people complain that their badger bushes with bloom won't fit the big access hole. :-) The brush would be dipped into the large hole in the scuttle to wet the tips in the warm water and then pressed into the top one to release some of the water which would drain into the bowl. The warm, wet brush would be used to wet the beard and defoliate. Lather was made seperately on a cake of soap and then used to face lather. The brush could be rested on the scuttle handle when shaving. The brush tips could be inserted into the large hole to hydrate the brush and for warmth between passes. I think these scuttles are a bit anachronistic, but a nice piece of shaving history. 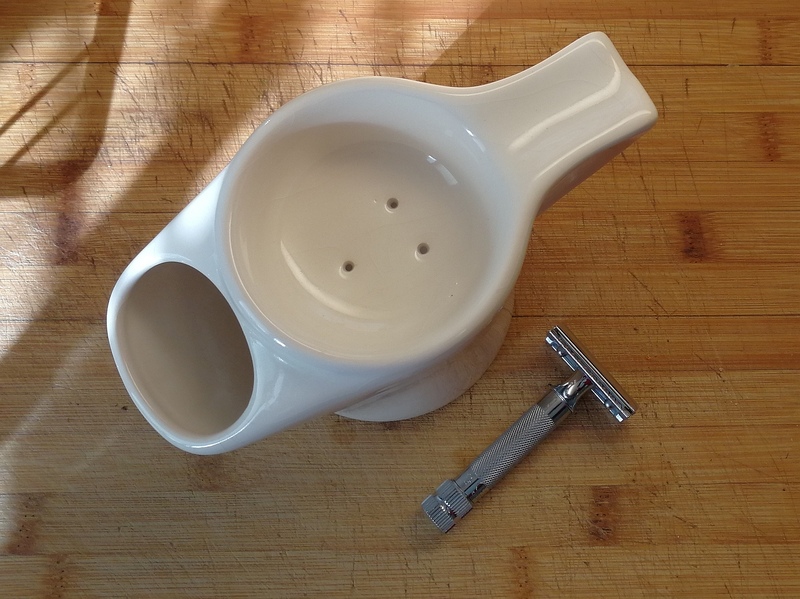 Newer designs of the shaving scuttle that use the Moss design are useful for keeping brushes and lather warm. This is a very good looking scuttle. I would pair it with an Omega Professional boar brush and some Colonel Conk bay rum shave soap. You can use hotter water. (03-04-2019, 04:17 AM)RonaldWadeL Wrote: jmho, this type of scuttle was used before people had running hot water in the house. The scuttle was filled with hot water from the stove. The shaving brushes were smaller then and likely to be boar. Boar brushes are more hardy and can stand more heat while also retaining the heat. Most people complain that their badger bushes with bloom won't fit the big access hole. :-) The brush would be dipped into the large hole in the scuttle to wet the tips in the warm water and then pressed into the top one to release some of the water which would drain into the bowl. The warm, wet brush would be used to wet the beard and defoliate. Lather was made seperately on a cake of soap and then used to face lather. The brush could be rested on the scuttle handle when shaving. The brush tips could be inserted into the large hole to hydrate the brush and for warmth between passes. I think these scuttles are a bit anachronistic, but a nice piece of shaving history. Newer designs of the shaving scuttle that use the Moss design are useful for keeping brushes and lather warm. After trying it out I agree with you on the anachronism, leaving the loaded brush in the top bowl does produce warm, nice lather, but I can get the same effect by leaving a regular bowl in hot water a while. That said, I am still happy for the scuttle, I find it to be stylish and it gives my Sunday shave a barbershop feel. I'm pondering sticking a smaller soap "permanently" in the top bowl and see how that works out. I searched Youtube for "traditional shaving scuttle," and found one close to my thinking. 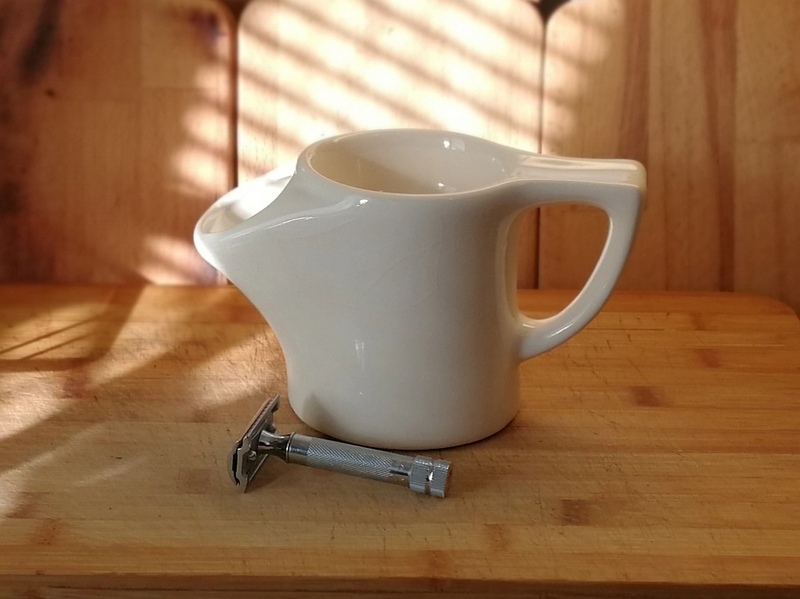 (03-05-2019, 02:52 AM)RonaldWadeL Wrote: I searched Youtube for "traditional shaving scuttle," and found one close to my thinking. Good find. Yep, that's how I've been using it and it certainly works. I'm contemplating sticking a small soap "permanently" in the top bowl just to see how that works, though. I do see videos with the hard soap puck in the bowl and sounds convenient. I think the idea there is that the holes drain the soap and allow heat. Also, I think the large hole was also used to pre-heat the razor in the day. (03-05-2019, 03:50 AM)RonaldWadeL Wrote: I do see videos with the hard soap puck in the bowl and sounds convenient. I think the idea there is that the holes drain the soap and allow heat. Also, I think the large hole was also used to pre-heat the razor in the day. I had the same thought with the holes. I worry about keeping soap pucks in a bowl in case it gets soggy underneath. That might just be my ignorance and a non-problem though. Thanks for that info. I have wondered about these since I see them on ebay quite often.